Most people have seen or heard a bird collide with a window in their home or at work, yet relatively few people realize the threat that bird collisions pose to the overall bird population. To birds, trees and sky reflected in glass look like habitat, so they often fly into them at high rates of speed. Collisions may seem uncommon, but it is estimated that over 1 billion birds die from collisions with glass in the United States alone every year. Almost fifty percent of bird collision deaths happen on home windows. By affixing a deterring item on the outside of windows to break up the reflection of the bird habitat around them, we can significantly reduce bird collisions. 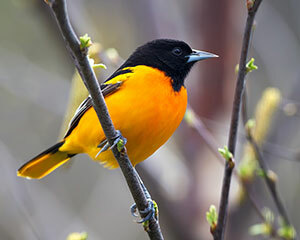 There are four popular and effective products used to make windows safer for birds. 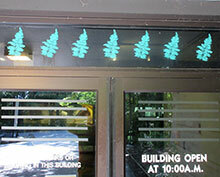 Using vinyl decals on the outside of windows is very common. 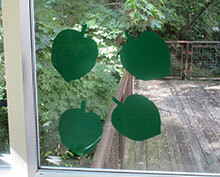 Decals are popular because the vinyl can be cut using stencils into any preferred shape. This is a fun way to decorate windows, especially during the holidays. To be effective, decals must be placed over the entire window. It is important to place decals close enough together that they can be effective. The Small Mammals building uses BirdTape on its doors so birds avoid the glass. Most birds will avoid glass with ¼-inch vertical stripes placed 4 inches apart or ¼-inch horizontal stripes placed 2 inches apart. American Bird Conservancy BirdTape is useful for creating patterns like this. You can purchase it at abcbirdtape.org. Using BirdTape is easier and more affordable than using vinyl decals. A product called Acopian BirdSavers is also very effective. It is a nylon cord that runs vertically across a window to make it visible to birds. BirdSavers can be ordered to custom fit any window, and the company that manufactures it also provides instructions on how to make your own. Visit their website: birdsavers.com. 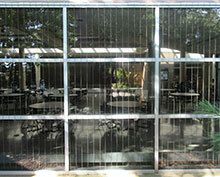 …but from the outside, they make glass much more visible to birds. Another product on the market, CollidEscape, is designed to be a solid sheet that is placed over an entire window on the outside. When viewing the window indoors, one can see out normally. 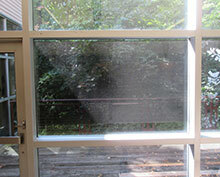 However, when looking at the window from the outside, there is a tint that reduces the reflection of the window. CollidEscape can be purchased at collidescape.org. 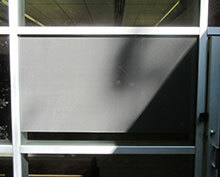 …and it eliminates glare on the outside so birds will not hit the glass. 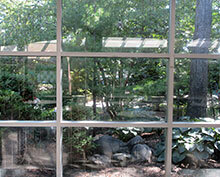 The Milwaukee County Zoo is committed to reducing bird collisions with glass both on site and in the community.